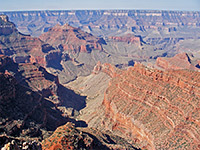 The South Rim of Arizona's Grand Canyon is expensive and overcrowded, and there is usually a shortage of parking and accommodation, but that of course doesn't matter as the canyon is the most famous natural attraction in the USA and possibly in the world. 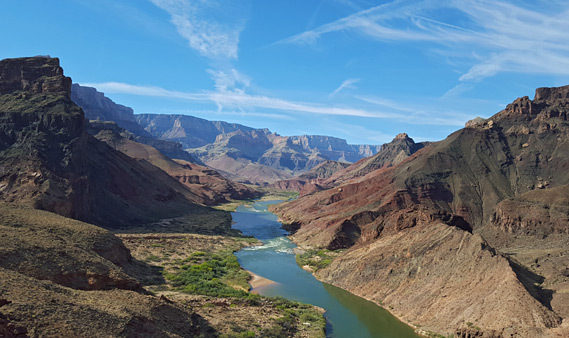 No-one forgets their first sight of the Grand Canyon and it will never fail to impress or offer something new, no matter how often it is visited. 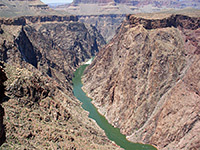 The great gorge, formed over many millions of years by the Colorado River, is 277 miles long, well over 5,000 feet deep for most of its length, and includes hundreds of tributaries. 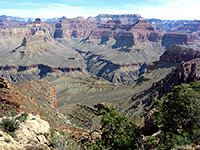 Grand Canyon National Park was established in 1919, and after several expansions, currently encompasses almost 2 million square miles of northern Arizona, with elevations ranging from 1,200 feet at the west edge, close to Lake Mead, to 9,165 feet on the Kaibab Plateau. Ninety percent of tourists see only the south rim of the Grand Canyon, since it is easily accessible and the main road (AZ 64) parallels the canyon edge for some distance (see map) - here there is every conceivable facility, many superb overlooks and a choice of hiking trails. The north rim, 215 miles away by road, is much more remote and high enough in elevation to be closed during the winter months by snow, but fewer people mean more peace and tranquility, and the views are just as good. 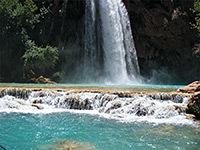 The only other part of the Grand Canyon that may be approached via paved roads is Havasu Canyon, contained within the Havasupai Indian Reservation to the west, although a day's hiking is necessary to descend from the rim. Still further west, a few unpaved roads of reasonable quality run through land of the Hualapai Indian Reservation including one down Peach Springs Canyon that leads all the way to the Colorado, giving access to many isolated side canyons as well as the river itself. 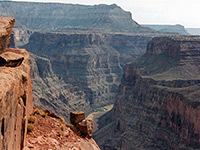 On the other side of the Grand Canyon, the particularly remote Tuweep area to the northwest can be reached by several dirt tracks of over 60 miles starting from US 89 in Utah and offers some spectacular viewpoints, but most of the countless square miles of the canyon and its branched tributaries are completely inaccessible by road. As others have said, sometimes the scale and extent of the Grand Canyon is disconcerting - the great gorge is too vast to take in at first sight, but a hike down beneath the south rim gives a more intimate and manageable perspective. 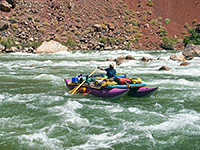 The two main trails to the Colorado River are the Bright Angel and the South Kaibab; this latter connects with the North Kaibab route which follows Bright Angel Canyon to the north rim. There are also many longer (unmaintained) paths suitable for experienced hikers, leading both to the river and along the canyon, such as the difficult New Hance Trail, the mostly level Widforss Trail on the north rim and very steep Lava Falls Trail near Tuweep. For inexperienced hikers, even a short walk along the level and partly paved Rim Trail (which parallels the south edge of the canyon for 13 miles) is enough to escape the all crowds at the major viewpoints. Holiday Inn Express Grand Canyon, the most popular of the hotels near the South Rim, is located just two miles from the southern entrance station on US 180 - in the middle of Tusayan, within easy walking distance of all its rather limited facilities, which include a small selection of restaurants and shops, the airport/helicenter and the Grand Canyon IMAX theater. 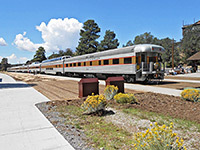 For the remote North Rim of the Grand Canyon, the closest main towns with hotels are Kanab and Page. 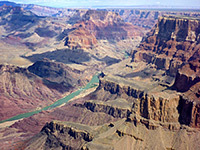 The best general map for hiking in the Grand Canyon is the double-sided 1:73,530 scale topographic map from National Geographic/Trails Illustrated, which covers the canyon from its northern point at Lees Ferry (Marble Canyon), as far west as Mohawk Canyon in the Hualapai Reservation.